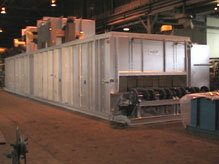 The furnace shown is an example of an ALUMINUM SOLUTION HEAT TREAT FURNACE. Rated at 1200° F, in this application, this furnace processes 9000 lbs. of aluminum per hour. It is a gas fired, 3 zone, 2 drive, 4 lane furnace, with an indexing conveyor, and a custom heater box arrangement. Because of the customer's floor space, and headroom limitations, (2) two of the heater boxes are mounted on the top of the furnace, while (1) one of the heater boxes is mounted on the side. This furnace was optioned with a quench tank, variable frequency conveyor drives, and a PLC. The approximate dimensions of this furnace are 80 feet long X 22 feet wide X 19 feet high. These dimensions can be reconfigured to fit into your facility. This type of furnace can be either gas or electric, and a broad range of handling and processing options are available.